Located in the south west of New Zealand’s South Island, Milford Sound is a spectacular fiord within the Fiordland National Park. One of the most breathtaking natural attractions in New Zealand, Milford Sound is a pristine and scenic destination which is a must-see on any visit to New Zealand. A fusion of stunning natural formations and incredible vistas around each corner, Milford Sound is also part of the Piopiotahi Marine Reserve and the World Heritage site of Te Wahipounamu. 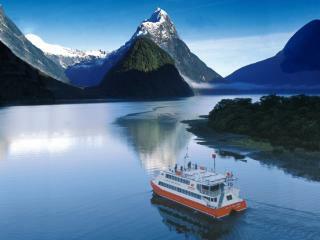 Carved during ice ages by glaciers, Milford Sound was described as the ‘eighth wonder of the world’ by Rudyard Kipling. The cliffs of the fiord rise majestically from the dark waters while mountain peaks appear to touch the sky and cascading waterfalls thunder down from as high as 1,000m. Although breathtaking in any weather, Milford Sound is transformed by frequent rain which has the magnificent effect of amplifying the waterfalls. Milford Sound is an attraction in its own right and there are many ways to experience its sheer beauty up close and personal. 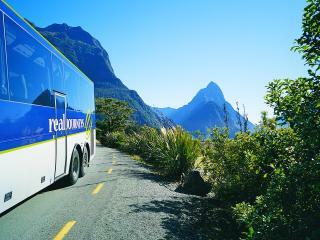 However there are also a great range of Milford Sound attractions to be enjoyed during your visit. 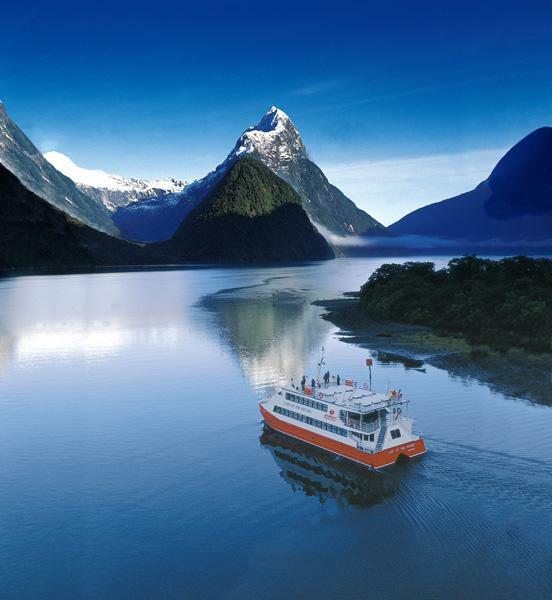 Cruises are one of the most popular ways to experience Milford Sound and there are both day and overnight options. If you’re feeling adventurous, you can also try sea kayaking, diving and scenic flights. Harrison Cove offers an underwater observatory which showcases unique local marine life including black coral, delicate sea anemones and 11-legged sea stars. For those who love the great outdoors, the Milford Track is fantastic for hiking and trekking. Beginning at Lake Te Anau’s northern end, the track winds its way through vivid wilderness and ends with a boat ride from Sandfly Point to Milford Sound wharf. The lush rainforest which clings precariously to the cliffs of Milford Sound is a spectacular sight and if you’re lucky, you might even spot penguins, seals, dolphins and whales in the waters below. 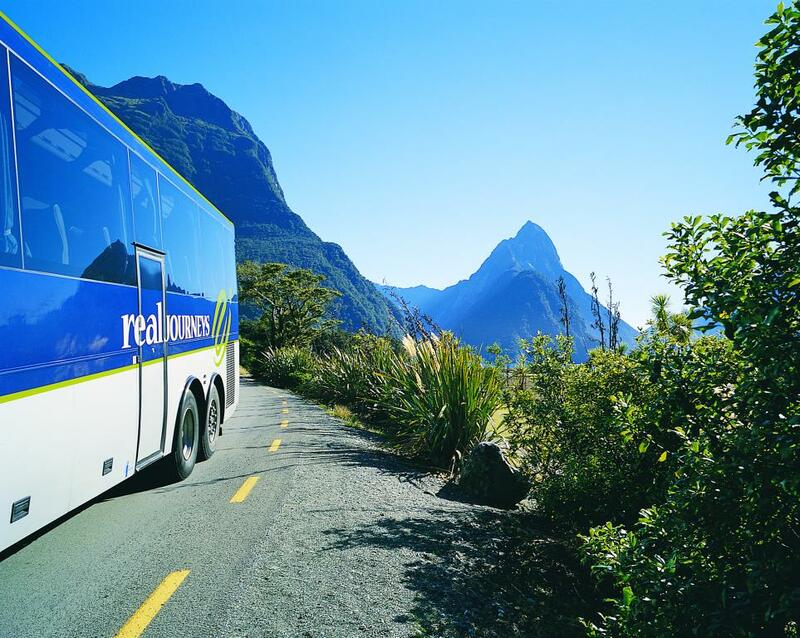 Located 295km northwest of Queenstown and 121km north of Te Anau, getting to Milford Sound takes between 2 to 4 hours by car. A stunning alpine drive, Milford Road offers spectacular landscapes on your way to Milford Sound. Passing native forest, mountain ranges, clear blue lakes and valleys carved by glacier, there are a number of viewing points along this steep and winding highway en route to Milford Sound. Visitors should allow plenty of time for getting to Milford Sound so that you can spend some time outside the car taking in the breathtaking landscape and sheer scale of the scenery. Just before arriving at Milford Sound, the road passes through the 1.2km long solid rock of Homer Tunnel. Milford Sound is a 15km inlet leading straight from the sea, but with a layer of fresh water on top. Steep mountains rise dramatically either side, with sheer cliff faces rising 1,200m or more. Some of the peaks are more recognisable than others, including the 1.517m Elephant, said to resemble the head of an elephant and the 1,302m Lion, said to be shaped like a crouching lion. An incredible wet area, Milford Sound receives a 6,813mm mean annual rainfall over 182 days of the year. One of the wettest and inhabited areas in the world, Milford Sound receives almost 7m of rain each year with up to 250mm falling in just 24 hours.